Dry leaf aroma: Pure cocoa. Wet leaf aroma: Smoky with a hint of damp hay. Preparation: Brewed western style in an all glass infuser mug. First steeping: 3 minutes 30 seconds at 205 degrees. Smoky aroma with notes of earth and hay. While the cup is hot I taste strong smoke and malt flavors, with a hint of bitterness. As I let the cup cool the bitterness is more pronounced. Second steeping: 4 minutes at 205 degrees. 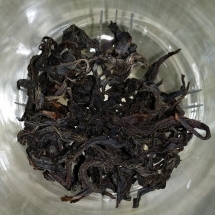 Almost identical to the first steeping. I was hoping the second steeping would bring out more flavor but I think I just personally perceive this tea as a very smoky Keemun. I’m not sure I will finish the sample package, though I’ve considered using it in a custom breakfast blend. Dry leaf aroma: Malty with a hint of yeasty sweetness. Wet leaf aroma: Malt and bread with a delicate earthy essence. Preparation: Brewed western style in a ceramic infuser mug. First steeping: 3 minutes at 205 degrees. This tea is as much a pleasure to smell as it is to sip with its malty bread aroma. The liquor is velvety smooth with a strong freshly baked bread flavor and a subtle buttery mouth-feel. As the cup cools I detect a bit of sweetness and the aftertaste is bread with a buttery note that lingers pleasantly. Second steeping: 5 minutes at 205 degrees. Very much like the first infusion. The buttery notes are more prominent and the mouth-feel is creamy with a yeasty aftertaste. 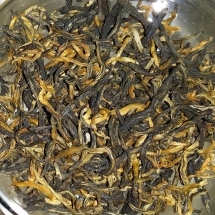 I wish I had time to do further steepings, as this is a tea worthy of taking your time to savor. One thing to note, the key for me with Dian Hong is to underleaf slightly or it comes out a bit bitter. I think that has more to do with my taste buds being quirky rather than being an issue with the tea or my water. Regardless, this is an awesome tea. Lovely to look at, intoxicating to smell, and heavenly to sip! 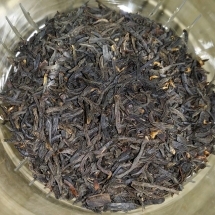 Dry leaf aroma: Fruit and hibiscus with the faintest hint of cream. First/only steeping: 5 minutes at 210 degrees. 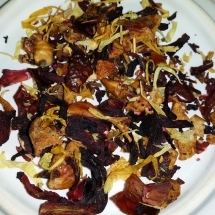 This tisane has a strong fruit and hibiscus aroma and brews a pinkish red liquor. The predominate flavor is tart fruit, with a very subtle note of cream at the end of the sip. While I cannot isolate the individual fruits, the infusion is neither too generic nor overly tart. However, the cream note throws me off and I am wondering if the Cream of Earl Grey sample packaged in the same mailing envelope contaminated this flavor profile. I received this tea as a free sample, and I want to thank Good Life Tea for the opportunity to taste this. Dry leaf aroma: Bergamot with undertones of creamy sweetness. Preparation: Brewed western style in a glass infuser mug. 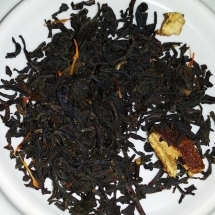 This Cream of Earl Grey has a pleasant creamy bergamot aroma. Freshly brewed, the black base is smooth and well balanced with the bergamot and vanilla flavors. Sometimes you get an Earl Grey that has too much or too little flavor, or a cream essence that veers towards artificial, however this one is just right. As the cup cools I note a sweeter, sugary undertone which suggested this would make an excellent iced tea. I received this tea as a free sample, and I want to thank Good Life Tea for the opportunity to taste this. It is quite enjoyable! Dry leaf aroma: Sweet hay and malt. 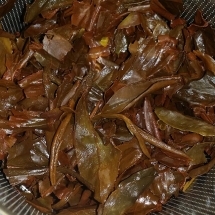 Wet leaf aroma: Damp hay with a vegetal tang. First/only steeping: 5 minutes at 212 degrees. The aroma is malt with undertones of honey and the slightest hint of sweet hay. The main flavors are malt and a pleasant bitterness, with a suggestion of hay at the end of the sip. A nice all-around breakfast tea. Typically I take mine with honey, but this one stands on its own. 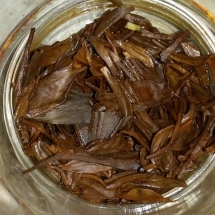 Dry leaf aroma: Sweet potato and malt. Wet leaf aroma: Slightly vegetal. Preparation: Initial quick rinse, then brewed western style in a ceramic infuser mug. First steeping: 2 minutes 30 seconds at 205 degrees. Red Jade stays true to its dry leaf aroma – pure sweet potato with undertones of malt. While the cup is hot the predominate flavors are sweet potato, malt, and a suggestion of something pleasant that is just beyond description. The mouth-feel is rich, smooth, and a bit creamy; the aftertaste is pure sweet potato. As the cup cools the malty notes come forward, along with a hint of cinnamon. Second steeping: 3 minutes at 205 degrees. Sweet potato is the main aroma for the second infusion. A mild cinnamon essence has appeared in this steeping and blends well with the malt and sweet potato flavors. The mouth-feel is smooth and tingly, and the aftertaste is sweet potato with a cinnamon undertone. 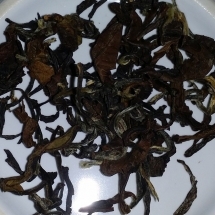 I did not detect any fruit notes during my session, as described on the Taiwan Tea Crafts website. 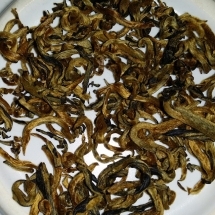 I am perhaps a bit biased towards this tea, as it is a TRES-18 hybrid (which is a cross between an Assamica strain strain from Burma and the local indigenous wild tea strain), to which I am partial. 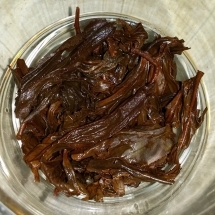 I enjoy it quite a bit regardless, and recommend it as a solid Taiwanese black tea. All nerdiness aside, I love “sweet potato” tea! I had to resist the urge to bust out the marshmallows. 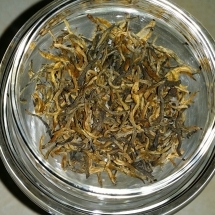 Dry leaf aroma: Sweet and crisp with undertones of honey. Wet leaf aroma: Slightly vegetal with suggestions of hay. Preparation: Brewed western style in an all-glass infuser mug. The aroma is predominately hay with subtle vegetal notes and the liquor is a medium golden brown. Honey Black tastes much like it smells, hay-vegetal-black tea, with an aftertaste of hay and a vegetal tinge. Funny enough, while drinking this tea I kept thinking about spinach. 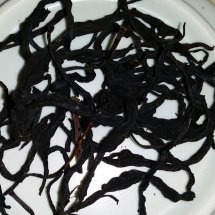 I find it odd to experience this in a black tea, albeit I am still learning a lot about varietals. Dry leaf aroma: Cocoa sweetness with a hint of malt. 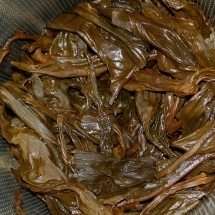 Wet leaf aroma: Damp hay with vegetal notes. Preparation: Initial 5 second rise, then brewed western style in an all-glass infuser mug. First steeping: 4 minutes 30 seconds at 205 degrees. 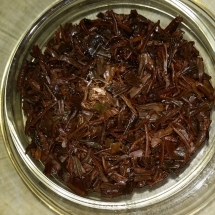 Freshly steeped the aroma is a fusion of hay, malt, sweet potatoes and cocoa. The liquor is a lovely dark amber and the flavor is smooth and malty with undertones of cocoa and the slightest aftertaste of hay. As the cup cools the taste remains strong with no changes in the flavor profile. The second brewing was very much like the first, though not quite as rich. I received this as a free sample in my order. Thank you Mandala, I enjoyed this quite a bit! Dry leaf aroma: Strong and pleasant orange scent. First/only steeping: 3 minutes at 210 degrees. The aroma is fruity with hints of blackcurrant; as the cup cools I detect a bit of orange. While the tea is still quite hot the fruit flavors are muddled together with a subtle bitterness and I get a slightly tart aftertaste. After the cup cools I can pick out the orange but I do not taste the pineapple at all; the bitterness remains. I have to confess that I dumped out my first cup as I thought I messed up the steep due to the bitterness. Unfortunately, the second cup was still bitter, though less so (I used less leaf for the second brewing). I might try this iced to see if it makes a difference in the flavor and bitterness. This is the second tea I ordered from Red Blossom and I am excited to finally do a tasting and prepare my notes. 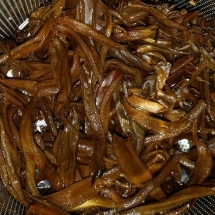 Dry leaf aroma: Sweet potato with a malty background. Preparation: Brewed western style in an all-glass infuser cup. First steeping: 1 minutes 45 seconds at 200 degrees. The aroma stays true to the dry leaf – sweet potato and malt, with a slight suggestion of orange. The liquor is a beautiful amber brown which seems appropriate paired with the aromatic suggestions of malt and sweet potatoes (perhaps I am ready for autumn; this color and fragrance combination is lulling me into nostalgia this evening). The flavor is multifaceted and at first it is hard for me to separate the different layers. Foremost is a pleasant maltiness with a delicate sweet potato undertone and I find as I let the cup cool notes of brown sugar appear. I was a bit disappointed I did not detect any raisin or maple syrup in this steeping (as per their website tasting notes). However, when I smell my empty cup the aroma is a heady raisin. The aftertaste is a reminiscent of sweet potatoes, with a slight starchy mouth-feel. Second steeping: 2 minutes 5 seconds at 200 degrees. A sweet potato and malty fragrance still prevails. I do not detect any scent of orange with this steeping but as the cup cools I pick up notes of raisin. For this infusion the brown sugar and raisin notes are shining through the base flavors of sweet potato and malt. The aftertaste is also sweeter, with a refined raisin finish. Third steeping: 2 minutes 35 seconds at 200 degrees. The third brewing has a much weaker aroma; sweet potato and malt again. The flavor is much the same as the second steeping though not as strong. The aftertaste is malty raisin and the starchy mouth-feel is still present. The fourth steeping was unremarkable though not unpleasant. I think three steepings is a good cutoff for me.